I've mentioned that I am not a Barbie expert, but when I saw this doll, I got pretty excited. 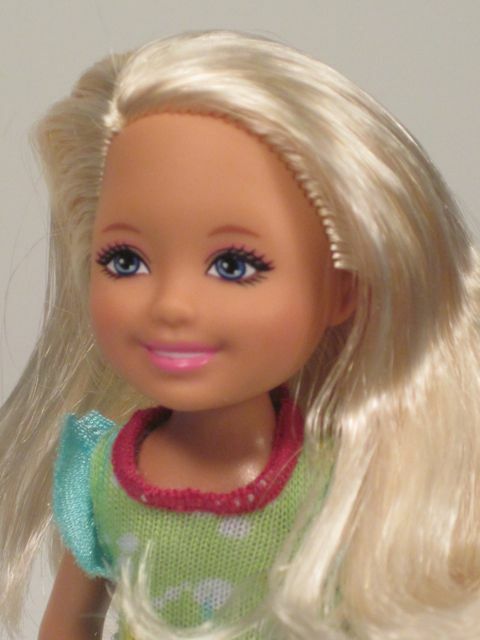 I got a little confused, too, because I always thought Barbie's younger sister was "Kelly." 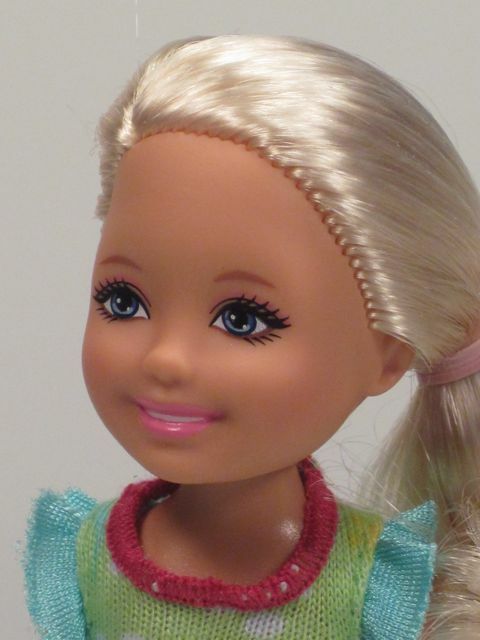 I like the name Kelly and I think it goes really well with the name Barbie, but never mind that. 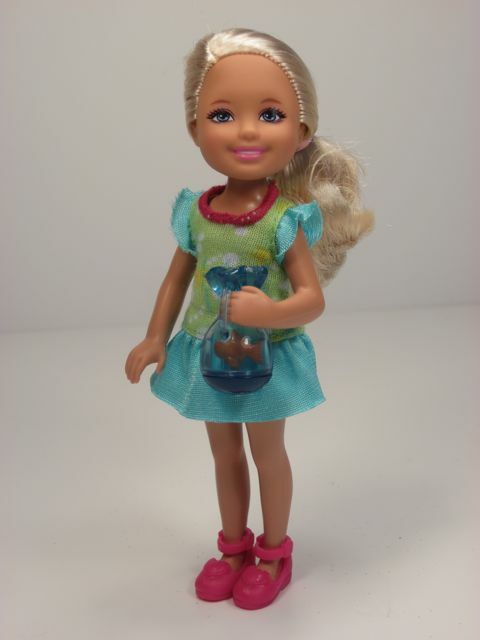 What's really great about this doll (aside from her $6 price tag) is that she has a pet fish. A fish. In a plastic bag. Let's face it, Barbie dolls usually come with impressive, out-of-reach accessories. 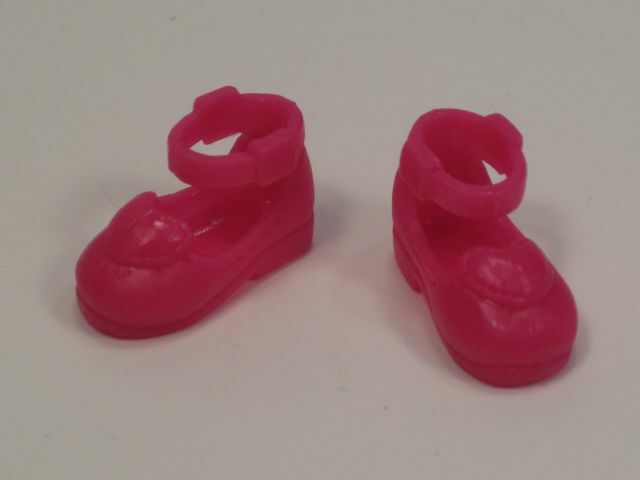 Barbie sometimes comes with a pure-bred dog (or a pure-bred dog with puppies), a new custom pink convertible car, a "dream townhouse," a new kitchen, a vacation jet plane, a pool...heck, even Barbie's shoes are so cute they're probably Manolo Blahniks. But a fish? That's an awesome accessory. 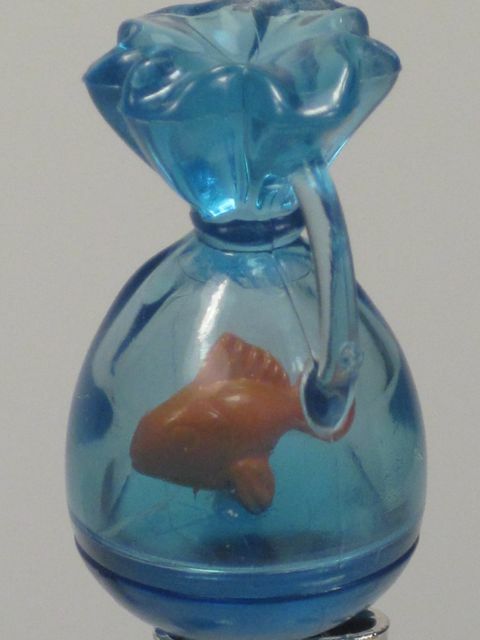 Virtually anyone who wants to can have a fish. And as a parent, it's easy to say "yes!" to a fish. 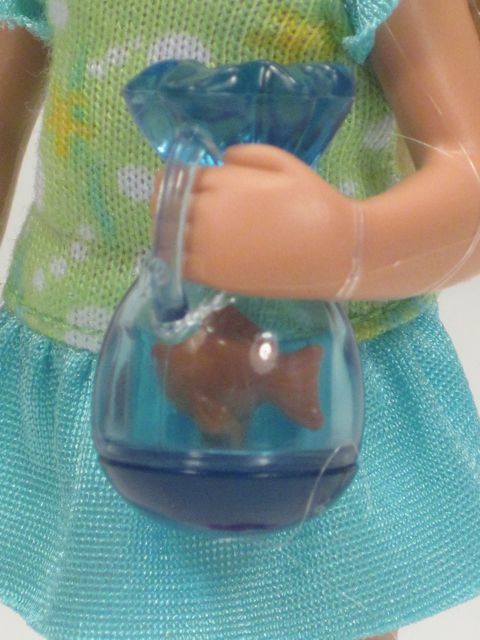 If your little girl buys a Chelsea doll and wants to emulate her by having a pet fish--that's a slam dunk moment. Buy a pet fish in a plastic bag and be Mom of the Year. Seriously, though, maybe buy the fish a nice tank, too. Actually, did you know that at certain chain pet stores they won't let you buy a goldfish (even a $0.25 "feeder" goldfish that is sold as food for other animals...) if you don't also buy a tank and a filter? Yep. My son wanted to "rescue" a feeder goldfish and they wouldn't let us buy it because we didn't want to buy a filtered tank. Needless to say, we went to another store, rescued our fish, and put it in a nice big (unfiltered) tank. That was six years ago and the fish is still alive and happy. True story. That's a huge tangent, though. Sorry. If I cut those rubber bands will she drop her fish?? The pattern on her dress looks like it is bubbles and sea weed...maybe some starfish? It's great that it matches the fish theme. The dress opens all of the way down the back and closes with velcro. It would be very easy for a little kid to change her clothes. I think she looks sweet without her shoes on, but the shoes are nicely designed and easy to get on and off. I guess they match the pink collar on her dress. I hate to complain, but how much cuter would the shoes be if those hearts were painted a different color--like maybe yellow. Better yet, the shoes could be yellow with pink hearts. Oh, well. She has a side part and a ponytail, but the ponytail can be let down. Her hair is very nice and soft. I actually think it is better hair than my Fashionista Artsy's hair. 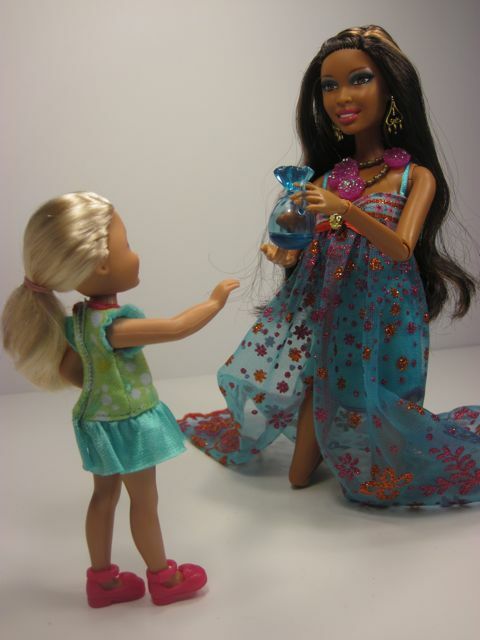 Here is Barbie Fashionista Artsy giving Chelsea her new fish! I am not sure how old Chelsea is supposed to be. Her features seem like those of a five or six year old...if not a bit older. The lips are really pink. But next to Artsy, she seems too short to be five or six. It's been a while since my kids were five or six (and they are both really tall) but I am still pretty sure she's a tad short. I'll direct you to a picture of my favorite celebrity toddler and you can see what I mean if you want. That little cutie is two and looks the same relative size as Chelsea. Maybe she's supposed to be two? Chelsea's posing is limited. She has articulation in her shoulders, neck and hips. Her head only moves from side to side, not up and down. Her head seems tilted up a bit, which is too bad because she can't admire her new fish. The bag has a handle. Bottom line? I don't get too picky for $6.00. The delight I felt at seeing this doll on the shelf with her little pet fish was almost worth $6 right there. Now that I've discovered that this is a nicely-made little play doll with changeable shoes and clothes, soft rooted hair and a charming expression, I am easily sold. I wouldn't pay $15 for this doll on Amazon, but at $6, she's a treat. I could complain more about the lack of articulation and the too-pink lips, but I'd rather not. Good play quality. 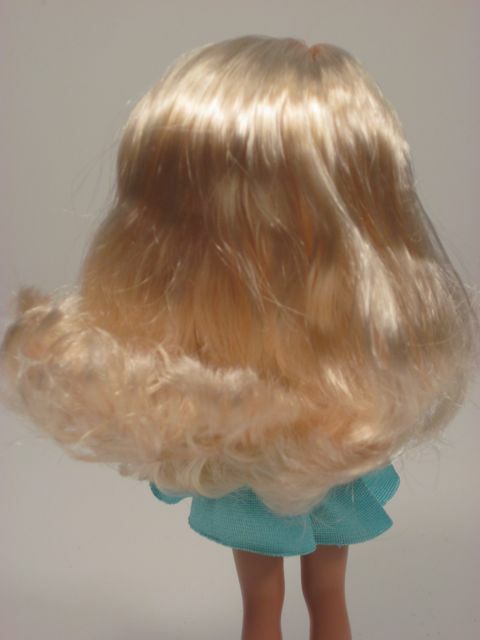 Sturdy little doll with removable clothes, nice rooted hair and removable plastic shoes. Standard small window box with cardboard background and plastic ties. No. This is a play doll. The fish-holding pose is not very versatile, and the articulation is limited, but the clothes and shoes are changeable and the hair can be styled. Recommended. Very cute doll with a unique pet for a good price. Love the fish! Chelsea is Kelly's friend. Kelly has many friends! Oh, ok! That makes a lot more sense..and it makes me feel better. I am glad that Kelly is still Barbie's sister. I am also glad that Kelly has so many nice friends! :) Thank you for the reference. You're awesome. I know, I know. I am a horrible fish owner! ;) The thing is, one of my most beloved pets as a kid was a goldfish named "Pumpkin." 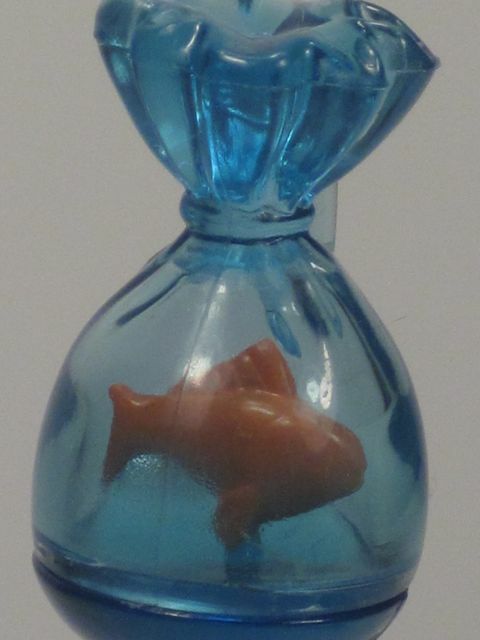 He lived to the ripe old age of seven and a half and was in the same kind of (almost round) bowl my son's fish is in. I figured if it was good enough for Pumpkin, it's good enough for any fish! 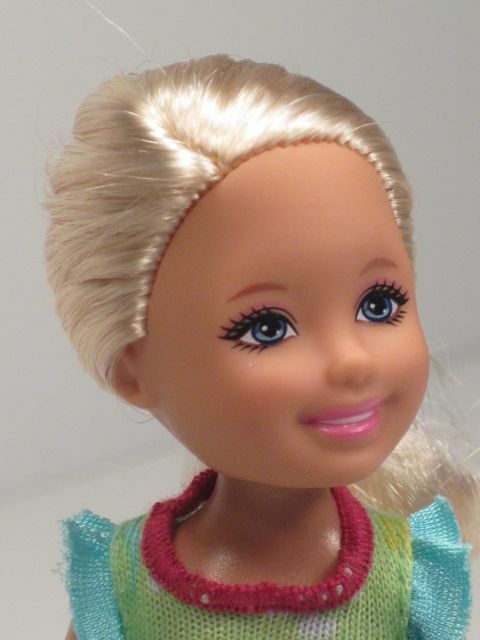 Actually Mattel discontinued Barbie's sister Kelly in 2010 and then they began making Barbie's sister Chelsea... so actually she isn't Kelly's friend, she is Kelly's replacement. If you carefully read the Wiki page, you'll find that "This character is of toddler age, and is a sister to Barbie, Skipper, and Stacie. Originally the baby of the family (replaced by her younger sister Krissy Roberts in 1999), she also has three older sisters: Barbie, Skipper, and Stacie. In Europe, she is known as Shelly. Kelly dolls have since ceased production in late 2010 and were replaced by Chelsea." So Chelsea is not Kelly's friend. Kelly is a thing of the past and Chelsea has replaced her as Barbie's youngest sister. The designers have no honor of Barbie's family's past. They design the dolls however they want them to be in the present. Like Skipper who began as a young girl around 10 or 12, then went to being a high school aged doll as tall as Barbie as in Totally Yo Yo SKIPPER Doll, now she is back to being between 13 and 15 and shorter than the extreme teen Skipper was. So it is very confusing trying to follow their family tree. Chelsea is supposed to be toddler age, but I agree with you that she looks more like a 5 to 6 year old and if you've ever watched the Barbie, Life in the Dreamhouse shows - she acts 5 to 6 also. Like I said - confusing. Actually, I don't think Kelly IS Barbie's sister anymore--the most recent movie that came out with Barbie and her sisters has Chelsea as the youngest sister:/ The newest sets of Barbie siblings are Skipper, Stacie, and Chelsea. Kelly has disappeared. Hmmm...I can't read the site with my current Flash player, but I'll take your word for it. Strange! How can Barbie just get rid of her little sister? Maybe Kelly decided to change her name. I tried to change my name when I was little...mostly by writing my new name, "Catherine," all over everything. Yeah, I really don't know what the point was of her sister changing--reminds me of the littlest sister on Family Matters who went upstairs and never came down. Chelsea is the same height/body style as the So In Style kids, but I don't see why they couldn't have just made the taller doll Kelly too. Poor kelly. Rejected. The hamster and lizard are my second favorite pets, too! I really want to get a close look at that lizard. That's the pet my eldest son wants now. I don't think so. I agree that Chelsea's face is a bit too grown up--especially if she's supposed to be two or three years old. She does, in fact, look like Lucy Ewing! My goodness. I had to Google a picture of her, though, because I couldn't have come up with that off the top of my head. 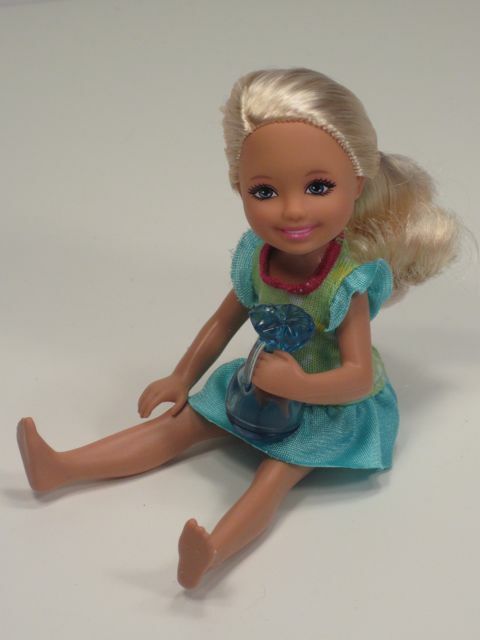 This particular doll from Mattel is cute. That she comes with a cute pet is a big plus. This line, with the pets, should include Tommy with his frog, cute as can be! I added a tiny pair of glasses for him and what a doll! However, no one mentioned the comparison with Only Hearts Club Little Sister, Jessica. I frequently trade heads so the FAR superior Only Hearts girls, (and guy, Trevor), can enjoy play time with my Mattel products. 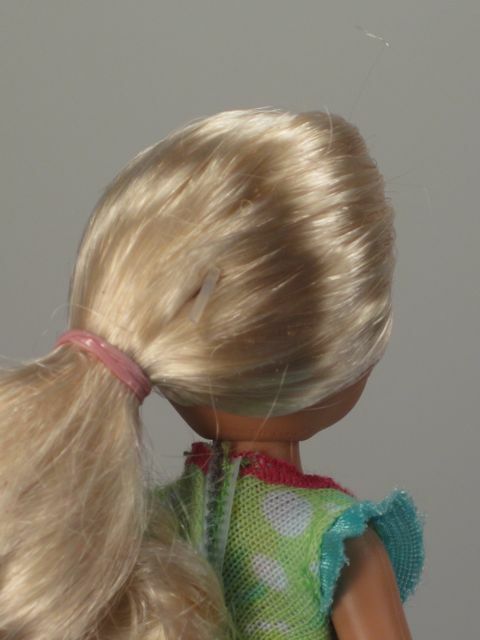 Jessica has fantastic glass eyes, realistic facial features and wonderful hair as all of the Only Hearts dolls do. The clothing is vastly superior, (pockets are really pockets! zippers, ties, fit, fabric quality, appropriate lengths and styles for young ladies, etc., etc. ), If Mattel has decided to abdicate the throne Only Hearts Club is a more than worthy replacement. Sadly, Barbies clothing pre-1970 does compare to the Club girls, but no more. The cheap fabric, shredding, poor fasteners, short, SHORT tight and often downright incomplete outfits are insulting and the common faces, ultra skinny, unhealthy look of the entire Barbie line is just a shame. Any outfit approaching sturdy, good quality MIGHT be on the collector line. It's sad, really. Maybe the company is just sick of Barbie, her fem buddy Ken and their cheap plastic, tacky homes. We're ONLY their customers. but for how long??? I like the idea and the feel of the cloth bodies of the OHC dolls, but they don't pose very well. Maybe little kids don't mind this too much, but for me (and maybe for older kids? ), I wish there was a more articulated plastic or vinyl body option for those wonderful faces. For instance, if an OHC head worked on a Liv body--that'd be something pretty special! HOW do you get them to rebody? I have been DYING to try this but can never seem to get the heads off even with a heating pat AND a blow dryer. I'm pretty sure they changed the name from Kelly to Chelsea because of the new mini show "Barbie Life in the Dream house". 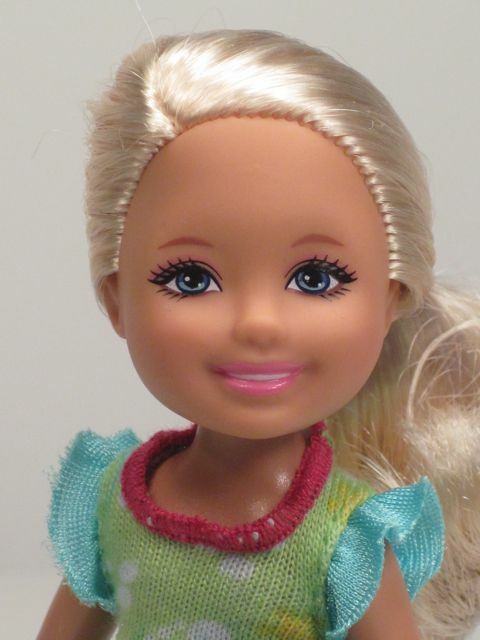 I like the doll but prefer the older Kelly dolls (expect their hands, which made them hard to dress) also I have never seen any of her friends or fashions available for her so I would not buy one. 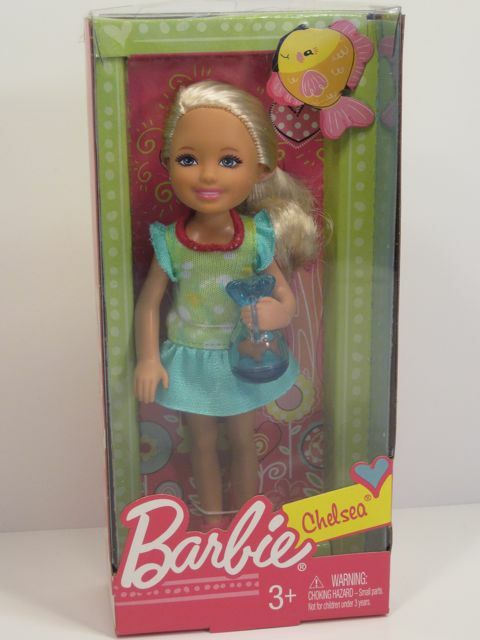 Chelsea existed as a toy before the show Barbie Life in the Dreamhouse. Chelsea is Kelly. It used to be Kelly, but they decided that Kelly wasn't a popular name with today's market, so they went with Chelsea which is much more popular. i was a little confused since i have a kelly doll. but i figured out why she has a fish! and why one of the others has a cat. watch barbie's life in the dreamhouse on youtube. Chelsie was one of Kelly's friends. 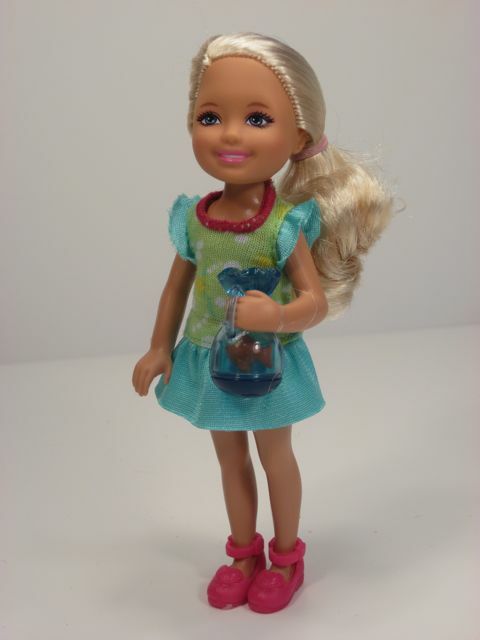 Chelsea is poorly introduced younger Sister of Barbie,Skipper and Stacie and older sister to Kelly and Krissy. Kelly dolls are 2-4 Chelsea is 5-7. If you have a Kelly doll you can compare it to Chelsea. I so am planning on lineing up 6 dolls when i get them and taking pictures so people can see things. Sense Skipper has been shrunk im getting old style Stacie. Barbie will be an adult. 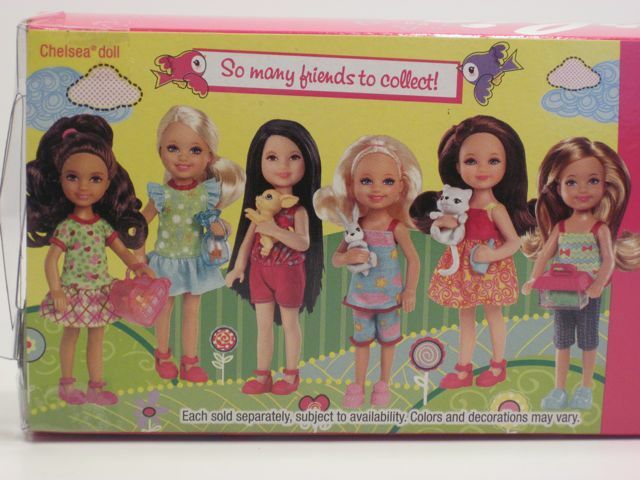 Skipper i think 15 but i need to study dolls face to decide fully.Stacie 8 going on 9. Chelsea 6. Kelly 3. Krissy 1. Barbie is designed in play scale every 2 inches is one foot. So here is my best aproximation of height for each girl. Barbie 11.5 would be 5.75 feet which transtlate roughly to 5'6". Skipper 10.5 inches 5.25 inches roughly 5'3". Now Stacie newer dolls 9.25 inches 4.625 feet roughly 4'7" for older Stacie dolls at 7.5 inches 3.75 feet roughly 3'8". Chelsea at 5.5 inches 2.75 feet roughly 2'8". Kelly at 4.5 inches 2.25 feet roughly 2'3". Just logic dictates if they were real based on age and family height Krissy would be about 1' tall. Many six year olds are just shy of 3'.